Hello and welcome once again to Flatpicking Guitar Magazine’s Free lesson portion of our monthly newsletter. This month’s selection is the ever popular standard,Limehouse Blues. Written in 1922 by Philip Braham, >Limehouse Blues has been played and recorded by everyone from Django Reinhardt to Tony Bennett. The great bluegrass banjo player Don Reno can be credited for popularizing this tune amongst bluegrass players. He had a way of recording jazz standards and making them accessible to bluegrass pickers. I have always enjoyed flatpicking this tune and jamming on it. 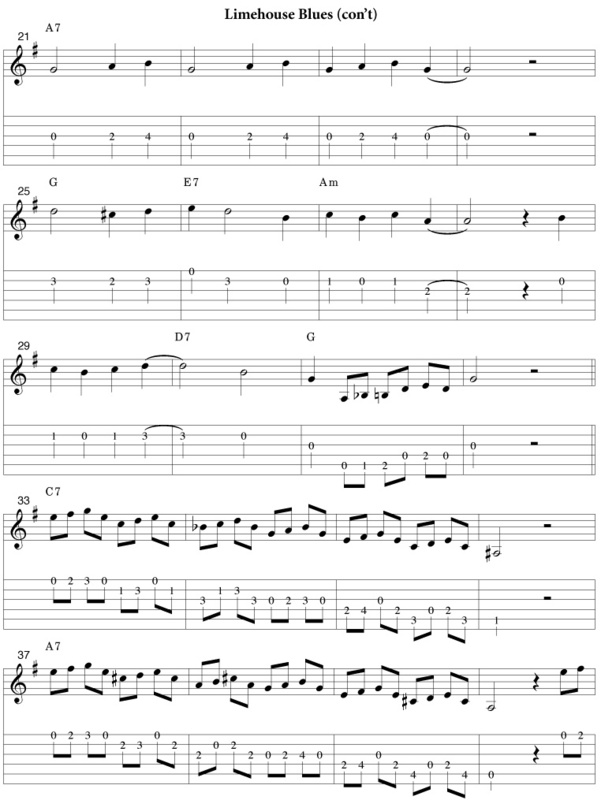 For this lesson I have presented a very melodic version as well as a more advanced solo through the chord changes. The form of Limehouse Blues is AB. Each section has sixteen measures. Both sections begin with the same C7 to A7 theme but they both have different turnarounds. The first turnaround ends with unresolved tension on the D7 chord while the final turnaround brings closure and resolution on the G chord (which is the key this song is in). I am confident that you will find the melody easy and exciting to pick. I find it interesting to note the repeated melodic phrase that appears over the C7 and the A7 chords. I enjoy the sound of the chords changing but the lick staying the same! 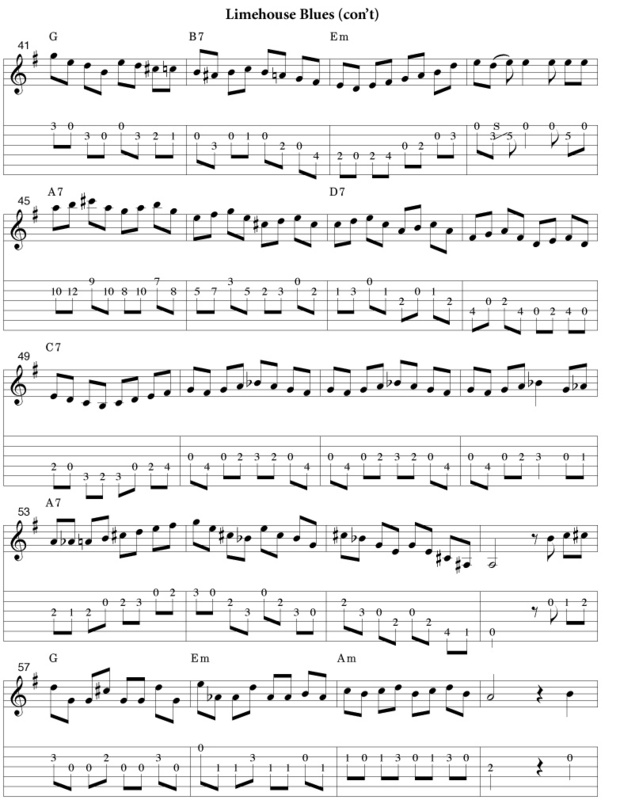 Once you get the simple melody under your fingers you can begin tackling the included solo. Inside the solo are various ideas I have picked up from listening to lots of different players. When I learn another players solos I try not only to learn that solo, but I try to pick out which licks I like the best. Then, I organize those ideas so I can apply them over any chord in any song. This tune is built for going to town on the improvised solos and it can be a great vehicle for inserting licks or phrases you have learned in the past. Don’t be afraid to try to improvise a solo. In fact, the overall tense feeling of this tunes makes it great for trying out new ideas as you jam. Lots of weird notes might end up sounding pretty cool. Just try to navigate your way to a “G” note by the end of the form. In reality, the “improvising a solo” concept is a lifelong study filled with endless musical ideas. Hopefully you will find some of my lines interesting. 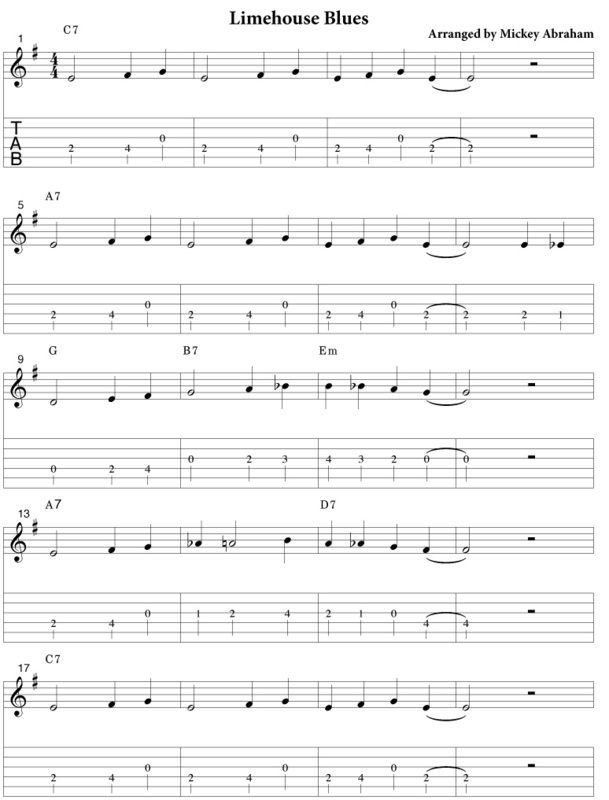 Check out the included lesson mp3 to hear the chords, melody, and solo in action.